What is Haven like without its Troubles? Actually, it's pretty nice, if a bit on the snobby side. Last night, Audrey traveled to an alternate Haven universe and learned what her friends' lives would be like without the Troubles. Well, if there's one thing that we've learned from this episode, "The Trouble with Troubles," it's that there's no upside to the Troubles. When Audrey wakes up to find herself in an unTroubled Haven, her friends have pretty nice lives. Sure, Vince and Dave are jerks when their biggest worry is whether a homeless person has invaded their hometown, but Haven is the safest town in America, Duke is a cop whose father issues don't involve murder, and Nathan has a family. Whatever enrichment Audrey Parker brings to people's lives, it hardly seems to compensate for a world in which the worst thing her friends suffer is a bout of ennui. However, in any universe, Duke has solid instincts. Perhaps his connection to Audrey is so profound that he will innately trust her even if he doesn't know her, or perhaps Duke is an idea cop: someone who works for the protection of others and who can sniff out a fellow do-gooder. Unfortunately for the denizens of Haven, William is, like Audrey, immune to the Troubles, and he's not happy about this new happy shiny Haven. This episode reminded a bit of Tru Calling, where Eliza Dushku's character was always trying to prevent deaths from happening and Jason Priestley's character would try to preserve the timeline by ensuring that the death would occur. But William doesn't have a philosophical interest in the Troubles; he just thinks that Haven is more interesting with them. 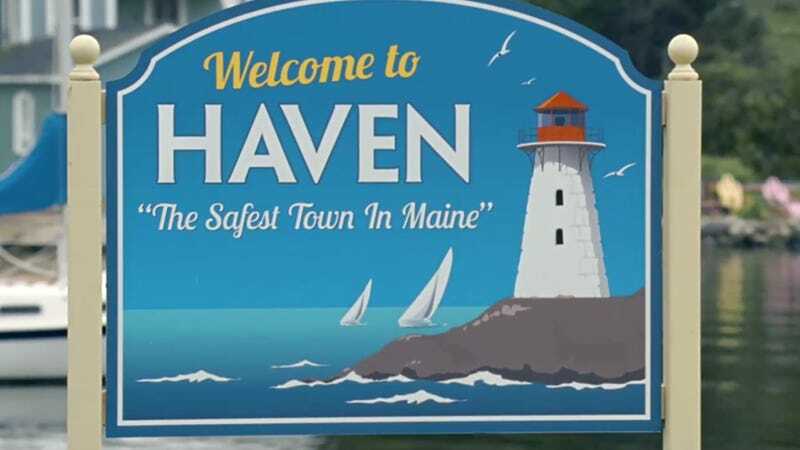 So William starts a killing spree across Haven, trying to figure out which person's Trouble created this alternate world, while Audrey tries to figure out who it is so she can protect him and preserve this version of Haven. What I find myself wondering now is whether Haven is pushing toward some sort of endgame. Certainly, it looked like the Troubles might end for twenty-seven years last season when Audrey prepared to walk into the barn, but it seems possible that William's ultimate revelation could give Audrey and company the tools to end the Troubles. And now that we know that William and Audrey are physically linked—so that whatever harms one of them harms the other—it seems that the Troubleshooters may be able to destroy both authors of the Troubles.